SCVHistory.com LW2976 | William S. Hart | Hart with James Montgomery Flagg's 1924 Kissel Touring Car. 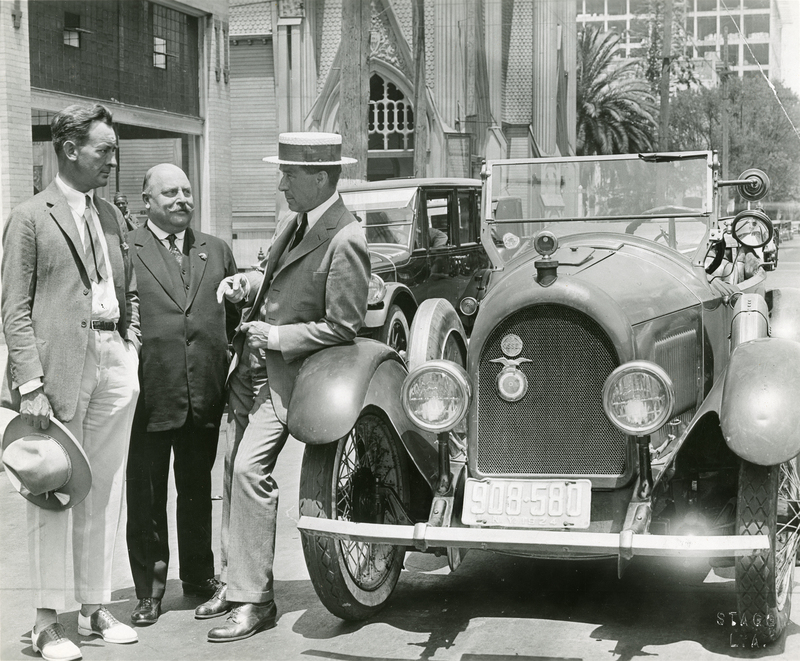 Actor William S. Hart leans against illustrator James Montgomery Flagg's 1924 Kissel touring car while talking to Flagg (famous for the "Uncle Sam" recruiting poster, "I Want You for U.S. Army") in what was probably a Kissel Motor Car Co. publicity photo. In between the two celebrities is a man identified (by whom, we're not sure) as W.H. Wurzburger. The initials are probably erroneous; H.J. Wurzburger was the owner of the Southern California Kissel dealership at 11th and Flower streets in Los Angeles. Several of Hart's friends were either Kissel owners or otherwise affiliated with the car company, including aviatrix Amelia Earhart and singer Rudy Vallee. The Kissel Motor Car Co. was founded in 1906 in Hartford, Wis., by Louis Kissel, the son of a Germanic immigrant from the Alsace region of France. Two of Louis' four sons, William L. Kissel and George A. Kissel, were involved in active management of the company. Kissel's production numbers were relatively low; depending on the source, between 26,000 and 35,000 cars and trucks were manufactured between 1906 and 1931 when the Great Depression took its toll. (By comparison, the 10 millionth Model "T" Ford rolled off of the assembly line in 1924.) Most popular was the yellow-painted Kissel Speedster, nicknamed the Gold Bug (which Earhart drove). All KisselKars, as they were known, ran on 6 cylinders. Only about 150 KisselKars are belived to exist today. Leaning on the fender of this 1924 Kissel tourster is William S. Hart, the famed silent film star who was a director as well as an actor. He concentrated on realism in a number of classic Western films. Hat in hand and owner of the car is James Montgomery Flagg, the illustrator of versatility and technical skill. He designed forty-five military posters for World War I, including the memorable one showing Uncle Sam pointing directly at the viewer. Between Flagg and Hart is W.H. [sic] Wurzburger. The distinctive Kissel was built in Hartford, Wisconsin from 1906 to 1931. Interesting Display in Kissel Cars at Wurzburger's. Unique Designs Attract Nation Wide Attention. Local Distributors Will Carry Full Stock of Parts. Los Angeles Sunday Times | September 11, 1921. A special display of custom-built automobiles that every Los Angeles motorist win be keenly interested in will be held this week at the Hope-street showrooms of H.J. Wurzburger, Kissel distributor, according to an announcement made yesterday by General Manager T.C. Whitcomb. The Kissel Salon will display to advantage the many custom-built models of the Kissel line, which are attracting national attention in motor circles because of their individuality of design, excellence of appointment and special custom-built features. Kissel's leadership today in its class-price field is built on the excellence of the workmanship, the fineness of the materials and the actual performances of the cars under all touring and road conditions. Gilbert Woodill, Coast factory representative, who last week made the formal announcement for the Kissel Motor Car Company of Hartford. Wis., of the appointment of H.J. Wurzburger as Southern California distributor was enthusiastic over the initial reception given the cars in their new home by the particular and fastidious Southern California motor car buying public. "Never has it been my privilege in all the years of my automobile experience to see a more cordial reception, given any motor car so shortly after the announcement of the appointment of the distributor as that which Los Angeles this week accorded Kissel. The reception was especially flattering to Kissel qualities, to Kissel reputation in this part of the country and to the rightness of the ideal which has actuated the Kissell [sic] Motor Car Company in the designing and building of the exclusive motor cars with which they are now amazing not not only the motorists but also the automobile dealer fraternity. "The firm from which a purchaser buys his car is of vital importance to him. Its financial standing, its service facilities, its will to please all assure him of continued motor satisfaction and the best of service arrangements. "H.J. Wurrburger is well and favorably known in business and financial circles here. He has built a reputation for honest dealings and reliable transactions that has won him many friends. They are rewarding him now in the interest with which they heed his new and vital move. "In appointing the local firm as Kissel distributors we looked not only into the financial backing or the concern and its business standing but also into its automobile record and the men who would be associated with the concern in the merchandising of the line. That T.C. Whitcomb was general manager was argument enough that every purchaser would have good treatment, courteous attention and every need looked after. For no man in the automobile business of the Southland, to my way of thinking, has made more friends in the business life and the business field which he has elected to follow than has this man Whitcomb." Wurzburger also announced that a complete stock of parts would be maintained at all times, invited present Kissel owners to visit the service quarters of the concern and extended a cordial invitation to the general motoring public to drop in and familiarize themselves with Kissel values. LW2976: 9600 dpi jpeg from copy print purchased 2017 by Leon Worden.